Written in 1911 by W. A. Morris, Montague, Texas. I WAS MARRIED December 12, 1867, to Miss Rachel Dennis, and for the first year we lived with my mother-in-law, Mrs. C. F. Dennis, about fifteen miles southeast of Montague on a tributary of the Willa Walla valley, about a mile and a half northeast of where the town of Forrestburg now stands. I afterward bought this farm and lived there until June 10, 1875, when I moved to Montague. On January 4, 1863, I went to Montague on business and remained there overnight. The next morning, which was Sunday, I started home and Captain D. S. Hagler, a brother-in-law, accompanied me. When we had gone about six miles we discovered a very fresh trail of 150 to 200 Indians crossing the road, going southeast. We were riding swift horses and thought if we got in sight of them we could outrun them. So we followed the trail around the north end of Jim Ned Lookout Mountain to a spring on the south side of the mountain at the road, from which point they had gone about a mile and halted, and where It seems they held a council of war which resulted in their hanging a red flag in a tree, after which they pursued their course in an easterly direction. We followed to a point where they again crossed our course and we decided that from the direction they had taken, their aim was to move down the Willa Walla valley. From where we then were, it was about three miles to the house nearest us in the head of the valley, or in the creek, and our main desire now was to take a circuitous route and try to reach this house and give warning before the Indians got there. We pushed forward with all speed and reached the house but the savages had been along before we got there. Two families lived at this place: A. H. Newberry, his wife and their son Henry, then about 14 years old: H. B. Newberry, a brother aged about 20 years; also W. D. Anderson, his wife and the latter's sister. When the Indians reached the place, H. B. Newberry, Mrs. Anderson and her sister were the only persons at home. A. H. Newberry and wife had gone to visit a neighbor about a mile distant and south of the Newberry place. W. D. Anderson and Henry Newberry were out gathering pecans, and seeing the Indians approaching, they abandoned their pecan sacks and fled towards a thicket which lay on the opposite side of a creek they would have to cross. The Indians gave pursuit but failed to find the two fugitives. When H. B. Newberry saw the Indians coming, he prepared for action. He barred the doors, and to give greater strength to these doors he pulled the bedsteads across and against them, placed his axe in convenient reach, got out his trusty rifles, and was ready to defend his home to the last extremity. The Indians dashed up, surrounded the house, and finding that this rugged frontiersman was prepared to give them a warm reception, they decided to leave him alone and move on down the valley. They were scarcely out of sight, and Mr. Newberry had just opened the door when we rode up. He told us where the other members of the family had gone, and while we were yet talking, our attention was drawn to a great volume of smoke rising down the valley not more than a mile away. The Indians had fired the home of J. C. McCracken. There was a young man by the name of George Masoner at McCracken's when the Indians came in sight and he, being well mounted, ran with all speed down the valley of Clear Creek, a distance of six miles, warning the people on both sides of the creek that the Indians were coming and urging them to take to the brush. G. W. and Alfred Williams lived at the first place below McCracken's. G. W. Williams and his family had gone about three miles to church, and when Masoner came along and sounded the alarm, Alfred Williams and his wife and her sister started at once for the brush, which was about 300 yards from the house, and to reach which by the shortest route they had to cross the field. Before reaching the Williams place the Indians ran across Dave McCracken and gave him a hot chase. He broke, full tilt, for the Williams place, aiming to stop there and help Williams to fight to a finish, but when he reached there, he found the house deserted and, glancing around, he saw Williams and family making tracks across the field going toward the creek bottom below. The Indians were crowding him and he ran around the field on the lower side of which was a rail fence across the valley, with a road along and parallel with this fence, and below it was a densely timbered bottom and briar thicket. When he got about midway of this jungle at the lower side of the thicket, he ran upon Williams and family, just as they were crossing the road into the thicket and there halted, with the resolve to fight it out rather than run any further. The Indians, whooping and yelling, were close upon him, about fifty charging down in a straight line, all in lunge of his shotgun, and when he halted and threw his gun down on the foremost of the gang, they all came to a sudden halt. He reserved his fire, for he knew that with an empty gun he would soon be killed. When his pursuers checked up he wheeled his horse and followed Williams in the thicket as far as he could ride, which was only about thirty feet, and here he sat on his horse and watched the Indians, one at a time, dash by. On the east side of the thicket in which Williams and family had taken refuge, lived a Mr. Carlton and family. They escaped to the thicket except a sixteen-year-old girl who had gone to the spring after a bucket of water. The Indians bore her away into a captivity worse than death. "Uncle" Austin Perryman lived at the next place, about three miles down the valley. The members of his family were his wife, their son William Perryman, his wife and three or four children. But to return to our movements: When we reached Williams' house and found that the Indians had gone on down the valley, we hastened to where I and Mrs. Dennis lived, which was about two miles south, on another prong of the creek, and when we got there we learned that W. H. Perryman and family had, on their return from church, stopped for dinner, after which they started for home, my wife accompanying them. Learning this, we dashed away at top speed, hoping to overtake W. H. Perryman's wagon before he reached home. F. R. McCracken and Sam Dennis joined us, making five in our party, and we reached the Perryman home just after the arrival of W. H. Perryman and those with him in the wagon, the Indians having passed down only a few minutes before. Finding my wife and the family alive and safe, brought a relief that words cannot express. Uncle Austin Perryman had long before, taken the wise precaution to fortify his house in a manner by which it was rendered proof against the attacks of those savages, and when Big Tree and his band approached the house they found not only a family fortress, but even the horses were securely protected inside of pens enclosed with heavy cedar logs, kith loop-holes at each corner, which latter extended in semi-circle from out several feet, thus giving the defenders within command of all approaches leading to the outer walls of the enclosure. When George Masoner—the Paul Revere of the Willa Walla—arrived and gave the alarm, there was no one on the place except Uncle Austin and his courageous wife. This old heroine removed her feminine attire and donned a suit of her husband's clothing, even to his hat, seized a rifle, and took her stand near one of the portholes. And that old mother knew how to shoot straight. A Mr. Nathan Long lived at the next house below. He had gone that day to another place he owned some two or three miles from his home place. On his return he encountered the Indians close to the line and near the corner of his field fence. Here he rushed into the thicket where he was overtaken, murdered and scalped. Meantime Mrs. Long had received warning in time to enable her to gather her children and fly to the brush. The Indians came up, rode around the house three or four times and finding the doors closed and doubtless suspecting the presence of a man with a gun on the inside, they withdrew and continued their course down the valley. The next house below was occupied by Savil Wilson, more familiarly known in that day as "Chunky" Wilson. Mr. Wilson's wife had died but a short time before, leaving to his care four or five little children. On this particular day he left those little children alone and went away somewhere in the neighborhood, and when that flying messenger of alarm and ill tidings, George Masoner, reached the Wilson house, he found these children helpless and without protection. He had no time to lose, the cruel savage was close at hand, and there were other families below to whom he must carry the alarm in order that they might escape with their lives. Mr. Masoner hurried these children to a place of concealment in a thicket, and resumed his errand of mercy down the valley. He was scarcely out of sight when the Indians arrived and seeing the doors open, they entered and as on other occasions, they appropriated such articles as they could carry away, after which they set fire to all the buildings on the place, including a number of large cribs filled with corn. Five miles below, the Indians came upon old man Marasco and his daughter, Mrs. Shegog, her Infant and two little daughters. They murdered Mr. Marasco and made captive Mrs. Shegog and her children. They had not gone very far when Mrs. Shegog's babe began to cry. This seemed to exasperate Big Tree and tearing the infant from the mother's arms the remorseless monster crushed its head with a blow from his pistol and cast the quivering form at the feet of the helpless mother. A little after sundown about twenty men got together, and gave pursuit. They came up with the Indians on Mocker Creek, and charged them, Tim Hart, being killed. During the excitement of this fight, Miss Carlton. who had been captured in Willa Walla valley, made her escape. From Macke Creek the Indians followed the Overland road in the direction of Gainesville, to the bluff on Elm creek, about a mile west of the town, and halted until daybreak next morning. Here they abandoned Mrs. Shegog, after having cut off her luxuriant hair. On Monday, the 6th, in the evening, this band of Indians re-crossed the Willa Walla valley about one half mile above the Perryman house. B. G. Parkhill, Arthur Parkhill and Thomas I. Fitzpatrick lived north of us, and by a singular coincidence neither of these three families had heard of the Indians being in the country until Monday evening when Arthur Parkhill came over to our place and was told of the raid. He hurried to his brother's place and took him and his family to his own home for better protection. His next move was to warn T. J. Fitzpatrick and family and induce them to take shelter at his house. They started with Mr. Parkhill and when about half way between the two places they met the Indians, and Parkhill and Fitzpatrick were killed. Mrs. Fitzpatrick was seized and scalped alive and then liberated while her babe and two little girls, aged four and six years, were carried away. After the Indians had left, B. G. Parkhill gathered up his family and that of his murdered brother, and brought them to Mrs. Dennis, where they passed the night. Early next morning, a posse started on the trail and soon came upon the bodies of the two men. Further on, they found Mrs. Fitzpatrick lying in a path with the skirt of her dress bound about her head. She was a corpse, frozen stiff, with her hands grasping the garment around her head. Sleet and snow had fallen during the night, and the trail of the Indians had been covered. When the snows had melted away, I rode out about a mile from the place of the killing and found the remains of the Fitzpatrick babe where the Indians had murdered it and left it to be devoured by wolves and vultures. 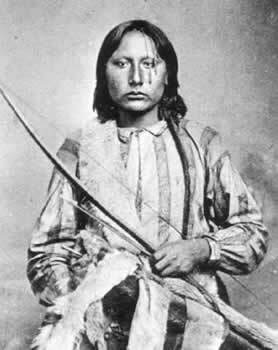 In 1869 Col. Leavenworth found the two little girls among the Indians in Western Kansas. He took them to Washington, D. C., and Congress appropriated $10,000 for their education. Several years ago I received letters from the eldest girl. She gave her name as Mrs. Thomas Hardy, and address as Weaverton, Maryland.